Can you like a smartphone when you can't even remember its name? With a big screen, 64-bit power and 4G speeds, the Huawei Ascend G620S gets you a whole lot of phone for your money. However, its underwhelming interface and the way it cuts corners let it down. Not so long ago, the fact that the Huawei Ascend G620S could be picked up for about £125/$150/AU$200 was a major point in its favour. It's still a definite plus, but with the number of low-cost yet impressive handsets now on the market, I can't be won over on price alone. So what else does it have? Well, 4G for one, coupled with a fairly large 5.0-inch screen, but with stiff competition from the likes of the Moto G (2014), the Sony Xperia M2 Aqua and the Microsoft Lumia 640, it's got its work cut out if it wants to impress. Its completely unwieldy name (which I must have forgotten at least six times by now) doesn't help matters. You might expect a cheap phone to look cheap, but the Huawei Ascend G620S makes a pleasantly surprising first impression. The back of the phone looks almost like leather, with an attractive, textured effect. It certainly looks good, but in reality it's a flimsy piece of plastic and feels that way when you hold it. Still, I'll take that over a plain plastic design any day. With its metallic edging and reasonably thin 8.5mm build, it could believably be a slightly more expensive phone. It's quite plan and still suffers a bit from blank-rectangle syndrome, with little in the way of design flourishes, but for what it costs I'm pretty happy with it. The slightly curved corners and textured back make it comfortable to hold and easy to grip. The power and volume keys are easy to hit, too. They sit along the right edge and stick out slightly from the body, which makes them easy to find by touch. They're also different sizes, so you won't mistake one for another. Given the phone's fairly large 142.9 x 72 x 8.5mm design, the side is a better place for the power button than the top would be. The phone's back cover feels firmly stuck on, but it's easily removable if you peel it off from the bottom right corner where there's a slight indentation. If you do, you'll see just how flimsy it really is, to the point where there's a slight concern it could break if taken on and off often enough. The battery is visible, but it's sealed in, killing any hopes of swapping it out for a spare. You'll have to take the cover off at least once to insert a micro SIM card and, optionally, a microSD card. Speaking of microSD cards, the phone supports cards up to 32GB and you'll definitely want one of those as there's only 8GB of storage built in. This is a truly tiny amount and less than I'd like to see, even on entry-level handsets. You're certainly getting a lot of phone for your money with the Huawei Ascend G620S as it's got a fairly sizeable 5.0-inch display. That's the same size you'd find on the HTC One M9, though it's not as sharp at 720 x 1280. Really, I'd like to see a 1080p resolution on a screen of this size, but it's hard to be too critical given how cheap the Ascend G620S is. You're looking at a resolution of 294 pixels per inch, which is identical to the similarly priced Moto G (2014). I don't expect a 1080p screen on a phone that's under £150, but given that it's 720p I'd prefer if it was a smaller 4.7 inches. Nothing looks as sharp as it could and that's especially noticeable when coming from a 1080p phone, but it's still bright and vivid. It's viewable at an angle, too, and once you've pumped up the brightness it's quite useable in direct sunlight, though it has its fair share of reflections. It's also a great size for enjoying media and games, but if you've got smaller hands you might have to adjust your grip to reach the very top edges. On the face of it, the Huawei Ascend G620S has a lot to shout about, or at least as much as popular rivals like the Moto G (2014). It might not have a fingerprint scanner, a QHD screen or any of the other flagship phones' bells and whistles, but for a temptingly low price it does offer a big screen and solid performance. With a £125/$150 (roughly AU$200) price tag, the Huawei Ascend G620S is almost as cheap as a smartphone gets. The likes of the Moto E (2015) and the Microsoft Lumia 435 have it beat, somehow scraping in at under £100, but there aren't many handsets that cost less than this. In fact, the Huawei Ascend G620S is so cheap you could almost buy four of them for the price of a Samsung Galaxy S6. That makes it a great buy if money is tight, if you just want a basic smartphone, or if you want a spare in case it gets lost or damaged. Of course a low price means nothing if the phone is a glorified paperweight, but with a 5.0-inch 720p screen, a quad-core 64-bit processor, an 8MP camera, and 4G support, this is hardly the case. Where it loses out to flagships is in resolution as it's only 720 x 1280, but that still puts it on par with similarly priced phones like the aforementioned Moto G and the Asus Zenfone 5. It even tops the likes of the Sony Xperia M2 Aqua, which has a 540 x 960 display. So it's pretty good for the price, especially as it's fairly bright and the colours are vibrant. It's far from compact, especially when coupled with the sizeable bezels, so it might not be the phone for you if you have small hands, but it's a good choice if you love to watch videos or play games. Quad-core processors are becoming increasingly common in budget smartphones, and the Huawei Ascend G620S is no exception, packing a 1.2GHz quad-core Snapdragon 410 chip coupled with 1GB of RAM. However, while many affordable phones have quad-core processors, a lot of them are 32-bit, whereas the Snapdragon 410 is a 64-bit chip. I don't feel like that's made a huge difference. 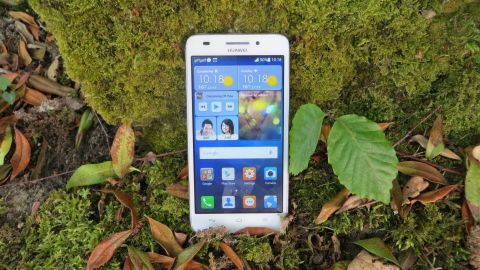 The Huawei Ascend doesn't have enough RAM to make the most of it and it doesn't run the 64-bit-friendly Android 5.0 Lollipop. Instead it's trailing behind on Android 4.4 KitKat. That's a big mark against it. Despite this, performance was generally smooth, and the phone had no problem navigating home screens or running apps. It could even cope with fairly demanding games like Real Racing 3, though the frame rate was a little bit inconsistent and sometimes dropped. Many apps would take a good few seconds to load and performance took a substantial hit when installing things in the background, leading to jerky transitions and scrolling. The Huawei Ascend G620S also offers 4G, which is common, but far from guaranteed on cheap smartphones. 4G networks are now widespread enough that I'd always recommend investing in a 4G phone, unless you're not planning on using data much when Wi-Fi isn't available. The 4G on the G620S is Cat 4, theoretically allowing for download speeds of up to 150Mbps, though real speeds are likely to top out at around 60Mbps. Even then you need to be in an area with fast 4G infrastructure. Right now there aren't many places where you'll be able to kick it into top gear, but that does mean it's surprisingly future-proof for such a low-end model. Even on standard 4G networks you can expect fairly speedy data. While you shouldn't expect high-end performance from the Huawei Ascend G620S, I was happy with it on the whole. It's certainly got promising specs for the price, with a 1.2GHz quad-core Snapdragon 410 processor and 1GB of RAM. Okay, so it almost seems like calculators have quad-core processors these days, but this isn't any quad-core chip; it's a 64-bit one. Given that the phone only has 1GB of RAM and runs Android 4.4 KitKat (which isn't optimised for 64-bit processors), it seems like buying it could be a waste, but it benchmarks pretty high, with a Geekbench 3 multi-core score of 1442. The 32-bit quad-core Moto G (2014) only managed 1142 in TechRadar's tests, and the Sony Xperia M2 Aqua scored just 1133. Even Huawei's own Ascend G7, which is a pricier phone, managed a mere 1398. Of course benchmarks aren't always an accurate indication of real world performance, and in practice it's a bit more of a mixed bag. Moving around the phone is a fairly smooth experience, whether swiping across home screens, browsing the web, using apps or even playing games, but it does struggle under pressure, with lag rearing its head when apps are being installed. While it can cope with most games, the more demanding ones sometimes suffer from low frame rates. I mentioned that the phone runs Android 4.4 KitKat and that is disappointing as not only is it unequipped to make the most of the G620S's 64-bit processor, it lacks some of the features found in Android Lollipop. It also doesn't help that Huawei's Emotion UI leaves quite a bit to be desired. It's nice and colourful, but arguably looks a bit childish. More problematically, there's no app drawer, so all your apps have to live on the home screen, which means it can easily look cluttered. In fact, Huawei has packed so many apps in that it looks cluttered when you first switch it on. I've never been a fan of pre-installed apps as they're usually not ones I'd choose, and it's easy to fill a phone with apps from Google Play anyway. It doesn't help that there are duplicates here, either, with two web browsers and two email clients.